The Mattress Underground (TMU) has over 11,000 topics, 70,000 posts, and 600 articles and pages. The content is mostly organized by topic. We are in the process of further refining and reorganizing the content and information on TMU. While we are going through this tedious and time consuming task we encourage visitors to research and read previous forum discussions to get the most value, and most efficient use of time spent on TMU. ~ Search Forum tab here or on the forum menu above. The two search tools will render different results. Once you decide on the key terminology that best describes your area or product of interest, simply type it in, click the search results links and read through the various posts or articles. 2. Posting questions on Our Forum ~ If after perusing the information on the site you cannot find the answers you are looking for, then you are welcome to Create an Account here and post your questions or comments on Our Forum. ~ Activate an existing topic ~ add and post your question (or related information) to an existing topic that most closely addresses or touches on the information you seek. Phoenix or one of TMU’s Expert Members will get back to you, but this may take a few days. Note: Your post may be transferred to a new topic in cases where it might confuse or interfere with the flow of (or "hijack") an existing topic. Your questions, findings, and contributions can also help others with similar questions who can read the comments, and answers and help make the forum a more useful resource. Last edit: 09 Jun 2018 19:49 by Phoenix. still doesnt explain how to actually start a new thread within the forums. I also have no "new topic" button. Tried the bog 3 browsers. Someone names SweetDreams posted a link where there is a button but I couldn't not find it. It would be great if this were fixed. Last edit: 11 Jun 2018 04:58 by Sweet Dreams. Phoenix: This is a very awkward way to post a new topic, especially if a question isn't directed to any specific expert member, and not at all clear to anyone who doesn't know the trick (you had to explain it to me personally a while back). Can this not be set up to start a new thread in the more usual way found on forums like this? I am also trying to start a new topic, specifically in the Expert section for Memory Foam Comfort. When I go to that section, there is no "new topic" green button. After researching very thoroughly on these forums and ordering a mattress from one of the members here, I'd like to ask a question about memory foam mattresses and need help, but am unable to even get the conversation started. Please help! MFC is one of the newest TMU experts on the panel. and while they are very excited to start answering posts at the moment they have some time constraints and will resume activity only after June 18th when their new topic button will become active. Meanwhile, the fastest way to ask MFC questions would be to call them directly. Even though it is a little less obvious how to post a new question while TMU has new features under construction we ask our visitors to initiate the new topics only from the Expert Members areas. 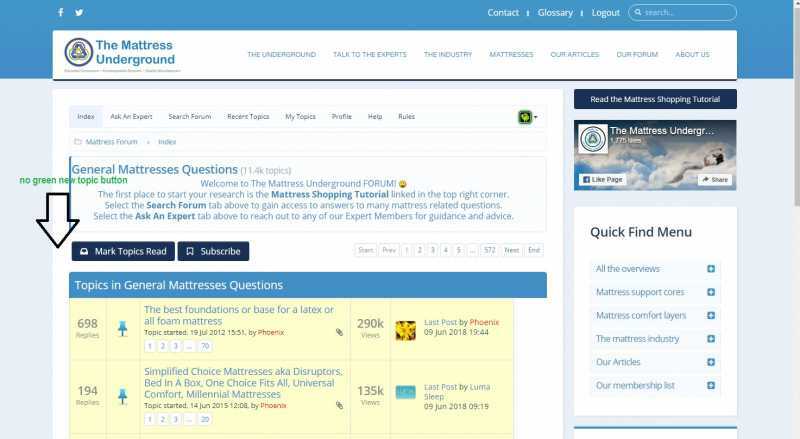 The Mattress Underground (TMU) has over 11,000 topics, 70,000 posts, and 600 articles and pages. The content is mostly organized by topic. Other posting options are mentioned in Post #1 above, additionally as needed we'll make small adjustments and move questions to new treads. Thank you for your understanding while we are working to make TMU a more useful resource. Thanks Phoenix. I do want to say I really appreciate all that you and the others do here and all of your hard work! I think one of the best advantages of this forum and other forums like these is that we do not have to try to find the time to call someone and then make sure it's during business hours, that we're taking notes, etc. It's a huge value to be able to ask a question at my leisure and then have someone respond when convenient for them, and have me (and others) able to review and go back to their response time and time again for reference if we forget or need to compare things. So, while I understand that this forum is not a revenue-generating thing and everyone has busy lives and day-jobs offline, it really limits the usefulness of the forum if I need general advice on a topic that a number of members could chime in on, but because of the "New Topic" structure I'm forced to either call a specific forum member or wait 1-2 weeks until that forum member becomes available for questions. Understanding that you can't respond to every single post, maybe you could designate a sort of "General" forum member expert to whom people could direct new topics that don't otherwise fall into any of the expert categories (or when one of the experts is not accepting new topics, as in my case)? In any event, just some thoughts and suggestions - again, I really appreciate all the hard work and great help you and others provide here.